Landing pages play an essential role in bringing the traffic which can be converted into qualified leads. They are all about ROI (Return on Investment) as their focus is on converting visitors into leads. It converts more than your homepage does. The entry page of your website should be your topmost priority as users visit it the most. So, it should be as such that it grabs the attention of the visitors and appeal them to know more about your services. In this article, we have covered up 101 superb examples of landing pages that you would like to copy to improve your conversion rates. It provides the viewer a clear cut message by the tagline stating, ‘How much is your home worth?’ They just need to enter the email address and receives personalized estimate in their inbox. ‘THE PERFECT TOUCH’ displayed on the top with brief description about its services, speaks volume about the company. And, also has a prompting fill up form on the right side. The overwhelming sky-blue color of the landing page makes it trustworthy, dependable and committed. And much highlighted tagline, ‘DO WHAT YOU LOVE’ makes the page even more appealing. It has a CTA (Call-To-Action) button of blue color stating ‘TEXT ME THE APP’. They just have to enter the mobile number and will get the text. The design of the page is attractive enough to attract the attention of the visitor. ‘Eat Better’ describes, they provide you with fresh chef-crafted meals and cooking kits delivered at your doorstep. It has two CTAs ‘SEE THE MENU’ or ‘Continue with Facebook’. The viewers just have to enter the email and their ZIP Code to get the menu in the inbox. The background of the page is unique and different. It has a tagline, ‘A daily learning platform for’ and the services keep on appearing one after another. It has a sky-blue color CTA button for sign up. Below that there is an option, ‘watch the video’ by just clicking on it video will start streaming. The color of the page gives it a pleasing look and even the menu is quite attractive. It has a tagline, ‘Spend time building, not billing’ which can draw the attention of the users. It also has a green color CTA button, ‘GET STARTED’. It has yellow color in it which is considered to be the happiest color according to the psychology. To prompt the users for taking an action of downloading the app, mobiles are displayed on it. And, the menu is there at the bottom of the page. The CTA button is there which provides user with a free flint premium trial. It is always easy to attract customers by offering them some gift or reward free. The services are also described in a crisp manner like Sell online, Invoice anytime etc. POP stands for Prototyping on Paper. The tagline, ‘Have an app idea?’ and below that ‘Make this real, with POP’, gives the visitor a clear idea about their services. It also has a video play button in the middle; if you click on it then the video will start playing. The page has a prompting tagline displaying that ‘WE ARE SPRY, WE BRING THE IDEAS INTO EXISTENCE’. The CTA of the page is ‘Discover’ and the background has a running live image. In the middle of the page, they have given an offer, Start your free 14-day trial today. There is a tagline describing their services, Sell online with Shopify. The page has two CTAs; ‘FIND A COUPLE’ and ‘SIGN UP’. There service is nicely described by the tagline which states, ‘Your Personal Wedding Planner’. Even the menu is quite descriptive. Its landing page is stand out among others due to the exceptional background. You just have to enter your email id and click on go. And, you will be getting constant weather snaps in your inbox. It has a tempting orange color CTA stating, ‘CLICK HERE TO START NOW’. The tagline of the page helps you in getting higher conversions from the landing page. And it is mentioned in the menu above that it is The Landing Page Conversion Course. The menu of the landing page is impressive as it describes why you should choose Plated and how it works. In the middle of the page, ‘Dinner that perfectly fits your life’ is written. It also has a CTA button to prompt you go for Sign Up. It has a tagline, ‘efficient & impactful web design’. And a blue color CTA button stating, ‘Get in touch with us’ that provides customer a satisfaction that they are there to help. In the middle of the page, ‘Choose your debt amount’ is written with a CTA button stating ‘Continue’. Once you select an amount and click on continue then it takes you to another page. The landing page is beautifully crafted as it has a ‘Get Started’ scroll down CTA button of red color. And also has a catchy headline stating ‘A Smarter Website for Products, Authors, Events, Leaders and Startups. It has a very appealing tagline, ‘What do you need done? Find it on Fiverr’. You just need to type the services you are looking for and then hit on green color ‘Find Services’ button. The icon itself speaks volume about the services offered by Interactly. There is a CTA button, ‘Get an Invite’. Viewers have to enter their email id in order to get notified. There is a yellow color CTA button, ‘SHOP THE SALE’. In the background, furniture is displayed with on sale tagline. On the top of the page, it is mentioned ‘WANT MORE EMAIL SUBSCRIBERS?’ in white color which looks very appealing on the black background. And the yellow color highlighted text, ‘Jumpstart Your Email List’ for free makes it even more attractive. The page has two blue color CTAs; ‘FREE REPORT’ and ‘DEMO REQUEST’. It also has a tagline in the center, ‘Convert Supporters into Social Media Ambassadors’. The menu of the landing page describes a lot about the services offered by them. And the tagline is trustworthy as it states, ‘NAMED, “Most INNOVATIVE SCHOOL” (AGAIN!) COME SEE IT FOR YOURSELF’. The background goes with the brand name as it is so simple. The text states, ‘Save YOUR WAY There’. It has a blue color CTA button, ‘START RIGHT HERE’. They let you save easily and bank beautifully. It has a scroll down landing page. A yellow color text is displayed, ‘Your Certified Organic, Probiotic Superfood!’ A learn more option is also there underneath the text. This is a stand out from others as it has three visual CTAs. And the background is very neat with a text, ‘No hassle Phone and Data services engineered for Your business’. The landing page has two CTA buttons; one in green and other in white color. And it is mentioned, ‘Sell, Market, and Service with the world’s #1 CRM’. A blue color Feedback button is also present at the right corner. It has an appealing tagline, ‘TELL AMAZING STORIES WITH VIDEO’ with a yellow color ‘BROWSE FOOTAGE’ underneath it. A video is running in the background which makes it more eye-catching. The page is in green color with a tempting tagline. Users just need to enter their email id to get access to the proven SEO tips. It has a ‘Chat with us’ option at the right corner of the page. The text is displayed, ‘Get higher conversion rates on landing pages’. And an orange color CTA button, ‘GET HELP WITH THE LANDING PAGES’. Let you build better connections with leads and customers. A green color CTA button is also present, ‘DISCOVER INFUSIONSOFT’ and a demo button is also present. The background is the icon of the brand which gives it a tempting look. A tagline is present at the top, ‘Manage all your social media marketing in one place’ with two CTAs button. The text is written in a dotted box, ‘Elevate Consumer Influence’. And a blue color CTA button, ‘REQUEST DEMO’ is present at the top right corner. The background of the page is very soothing and a green color CTA button makes it even more peaceful. The text is displayed besides the mobile stating, ‘Weather is unpredictable’. And an orange color ‘DOWNLOAD NOW’ CTA button is also present. The page has three blue color CTAs with a text displayed on the top, ‘Hate waiting on hold? Then don’t!’ The reason that it stands out from others is that it has plain white background. The background of the page is divided diagonally by two colors. It has a pink color CTA button, ‘Create your team now’. This has a blue color sign up form at the right side with a yellow color ‘DOWNLOAD NOW’ option. It also explains, ‘How to Select a DAM’. The background is exceptional that is why appealing. A ‘Chat now’ option is also present at the right corner of the page. And to get a free Strategic Analysis of your SEO & Content Marketing just enter your email id and click ‘Next’. The landing page greets you with a pop up box. The background of the page is in blue color with a ‘GET STARTED’ option. It is a scroll down page. When you click on it, a pop-up box appears. It is a briefly descriptive page. The background of the page is constantly updated according to the seasons, festivals, etc. It has a red color button for ‘Downloading Templates’. The tagline is very impressive, ‘Edgar doubles your traffic’. The background is full of fishes floating in the water with a pink color, ‘Get Your Invitation’ option. This has a blue color, ‘GET STARTED’ option with a tagline, ‘Flexible loans tailored to your business’. It also presents the viewers with a video option. The text is displayed on the image, ‘Superbly Crafted Wines Delivered to Your Door’. The menu describes all the services provided by the brand. It lets you ‘See where your money goes’. Two Call-Two-Action buttons are present right below the text. The tagline is very motivating, ‘Be known for what you love’. The service is briefly described; Klout helps people who want to be great at social media. The background is eye-catching. And the three CTA buttons in white color imparts a unique and different look. The text is also highlighted in the white color, ‘Content that works’. The service is described in the text, ‘How To Enhance Customer Experiences and Increase Company Revenue With Proactive Chat’. A green color chat option is also present at the right corner. A sign up for 30-day free trial is present at the right side of the page. Viewers can also watch the video to see Gridset in action. It is a mobile application with a tagline, ‘SHOW THE WORLD HOW YOU REALLY FEEL’. The service the app provides is described; ‘Super is a bold new way to share with friends, both old and new’. The text is displayed in white color at the center of the page, ‘The Operations Platform for Any Business’ with a scroll down option to see other features. It provides users with Nuts about Stats. This is available in the iPhone application store. And five creative visuals are present as CTAs. The tagline speaks volume about the service, ‘OFFERING HOPE FOR FAMILIES IN THE TRENCHES’. The menu of the page describes a lot about the company. The text is displayed on the grey background in white color. It lets you setup your self-hosted parse API and also has two CTAs. It has form at the left side of the page which provides you with a handbook of SaaS providers in your inbox. He page has a beautiful combination of blue and grey color. The page is standout amongst others due to its brown color footer mentioning different features. It also greets you with a pop up box so that you can see details. The tagline of the page is ‘Start Accepting Credit Cards Today’. There are two green color CTA buttons. The text is written in white color which appeals customers to click on ‘Get Started’. The best part of the landing page is the image in the background. And, the tagline is just written above the ‘Get Started’ button. An attractive image is placed next to the text with a brown color CTA button, ‘Send a GiftRocket’. The bottom of the page is in sky blue color with 3 visuals. And the text is displayed in white color. It also let you search, where are you going and lets you find a place for parking. It has two green color CTAs button and the tagline is displayed in white color, ‘The Best App for Connecting Golfers who Love the Game’. Two orange color CTA buttons are displayed in white color, ‘The world is your gym’. The text is displayed in white color over a dark blue background. It has a sky-blue color CTA button, ‘INSTALL HIVER FOR GMAIL’. The bottom of the page has six features mentioned. The text is displayed in white color above the video play button. The green color, ‘Try it free today’ looks very tempting to the viewers. And the tagline is displayed in white color over a neat background. One of the most attractive landing page as it has two red color CTA buttons at the right corner. And the text is displayed in white color along the left side of the page. It has a CTA button, ‘SIGN UP FOR FREE TRIAL’. And the text is displayed in blue color, ‘LEAD BETTER MAKE SMART DECISIONS’. The background of the page is in white color with green color Call-to-Action, ‘TRY IT FREE’. The page appeals the user to enter the email address and click on ‘Subscribe’ to get the ideas related to the content you like in your inbox. The page is divided into two parts with grey color in between where text is displayed in white color. It has two CTAs button; one of blue and other of orange color. And the tagline is written on the left side in grayish-black color. The CTA button is in white color, ‘DOWNLOAD TAXIBEAT’ which is for free. And company’s services are mentioned at the bottom. The free trial service is highlighted on the page which tends to attract the attention of the visitor. And the text is displayed in white color. It has a CTA button, ‘How it Works’ and when you tap on it then three features are described on the page. The tagline describes the service of the brand, ‘Online ordering built just for your restaurant’. It also has a ‘Watch Video’ option which when pressed, video starts streaming. The page is in royal blue color which imparts it a unique look. And the text is displayed in white color, ‘Discovering concerts have never been easier’. It requests viewers to bring a change with the motivational tagline and underneath that there is a ‘Play Video’ option. The bottom of the page is in dark blue color which speaks volume about the company. And it also offers free trial. The page has a unique layout with a CTA in the center, ‘Request a Tour’ and a tagline just above it. It has a compelling CTA in purple color. The users just have to enter the email id to get started. The center of the page is in sky-blue color which includes a tagline and CTA. The image is encircled and an arrow takes it to the green color CTA button, ‘Sign up now’ to promote the content. There is a tagline, ‘THE WORLD’S MOST GENUINE FLORAL EXPERIENCE’ with two red color CTA buttons. It has a catchy tagline, ‘Payments Made Awesome’ and a green color CTA, ‘Get Paid For Free’. The bottom of the page is in white color which appeals the viewers to ‘Listen to The Album’. The tagline is displayed on the right side in the center of the page. It is a scroll down page in sky-blue color and has a compelling CTA, ‘Sign up with LinkedIn’. The page has a sign-up form which compels the user to sign up for the free Wistia Account. Both the copy and design are simple yet informative. The form is accompanied with a capricious and clear visual in which you need to fill the basic information for creating the account. The copy of this site gives it an exclusive look. The words, ‘The Leading Career and Mentoring Platform’ displayed on the site gives the user a sense of satisfaction. The page is lovable and amazing and the main motive of the brand is displayed in the best way possible. It also has an ‘Apply Now’ form for drivers through which they can easily calculate, how much they would earn in a week time. It has an instant Call to Action which indicates where you can find a workspace. It has simple yet effective copy, so that visitors get to know what does the company offers. The straight forward headline and brief description of the eBook help the users in knowing why they should download it. The stand out on the page is yellow color CTA button- ‘Contact sales’. 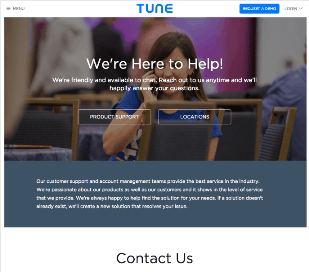 The beautiful design of the page with calls-to-action and neatly displayed contact information gives it a tempting look with the welcoming line, ‘We are here to help’. The landing page stands out from others due to its convincing copy stating, ‘GIVE US A SHOUT OUT’ and a compelling Call-to-action. The page is designed for three types of visitors. And it even motivates the people by stating, ‘You can learn anything’. The top is split up into two, featuring two different services. As soon as the visitor moves the mouse over the CTA’s, a simple form pops up which plays a great role in converting. So, above you get a list of some of the best examples of landing pages that you would definitely prefer to copy. Take a look at what these brands have to offer and accordingly make the changes to improve your conversion rates by providing the visitors easier and enjoyable experience on your landing pages.